Contact Us Today to Schedule a Complimentary Dental Implant Consultation! Dental implants are titanium screws that are placed into a patient's jaw to aid in replacing missing or extracted teeth. 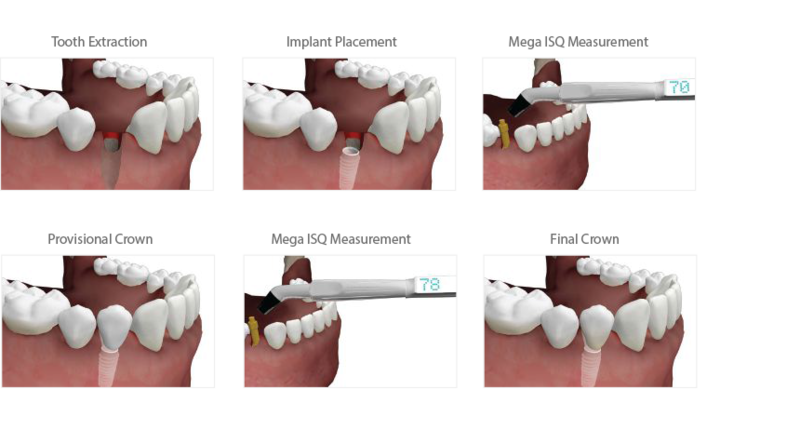 The implant acts as an anchor or artificial root which houses a metal post that protrudes from a patient's gum. A patient's natural bone will adhere or bond to the dental implant. Your dentist will then insert a new crown onto the implant. When installed correctly, dental implants have a success rate over 95% and serve as a long-term solution for patients who want real looking teeth that perform like natural teeth. What is the difference between Dental Implants and an All-on-Four Implant Restoration? One of the guiding principles of Elevated Oral & Implant Surgery is - "To incorporate proven surgical techniques and technological innovation while ensuring patient care and attention." We understand that dental procedures are an investment in your future and we want to improve patient outcomes and increase the value we offer to patients. In our relentless pursuit of this mission, we recently acquired the Mega'Gen ISQ Dental Implant Stability System which allows Dr. Barroner to measure the stability of a dental implant during placement or exposure which helps you get back to normal form and function sooner. Having this innovative technology can give Dr. Barroner the confidence to place dental implants the same day of a tooth extraction (in some cases). This can significantly decrease the time you might otherwise have had to wait before getting your final restoration placed on the dental implant. Dental Implants not only provide you with fully functioning, natural looking teeth, they also help preserve facial bone and structure by preventing bone deterioration that can occur when teeth are extracted or missing. ​After a tooth is lost due to an extraction or trauma, the jawbone beneath the missing tooth atrophies or resorbs. This condition makes it difficult to effectively position a dental implant in this space and as a result, most patients who suffer from this condition are not a good candidate for dental implants. To counteract this scenario, Dr. Barroner may recommend placement of bone grafting material to help reduce bone loss in the space needed to support the dental implant giving us the opportunity to restore functionality and aesthetic appearance for our patients. You may have current diagnostic x-rays from your dental provider which we will happily evaluate and utilize during your consultation and treatment. However in some cases the images may be outdated or of limited diagnostic quality or more information is needed in which case Dr. Barroner may prescribe additional x-rays including panoramic or cone beam x-rays. A cone beam CT-Scan provides Dr. Barroner with the ability to look at all angles of a patient's jaw structure and provides her the opportunity to digitally plan your surgery before the actual day of the procedure. This extreme attention to detail helps ensure the implant placement is completed effectively and increases the likelihood of a positive outcome. In addition, Dr. Barroner is able to share the 3D images and plan with your dentist to streamline the coordination of care. Dr. Barroner is very conscientious of the levels of radiation her patients are exposed to and therefore carefully considers the information she needs before requesting x-rays (the ALARA principle---as low as reasonable achievable).